The month of October has seen a lot of jury duty. Seriously. And it is not over yet. But they give us a long lunch in the middle. 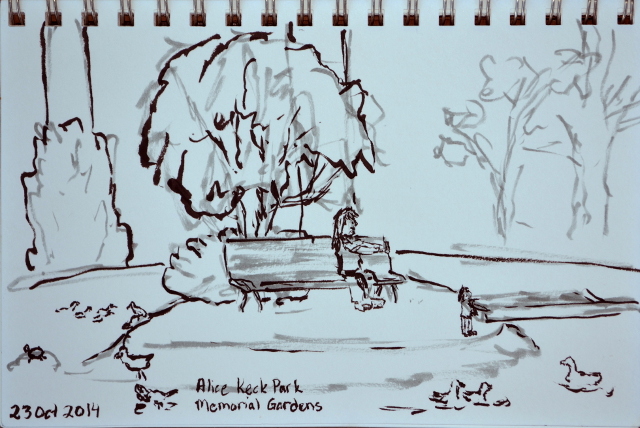 There's always someone to feed the ducks in Alice Keck Park Memorial Gardens. The shops across the Sunken Gardens of the county courthouse are quite cute. 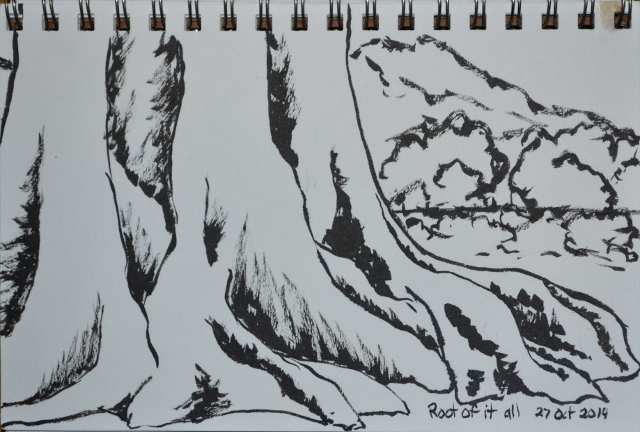 The always amazing roots of our ancient fig trees. Are they really fig? Strange fruit was raining down. 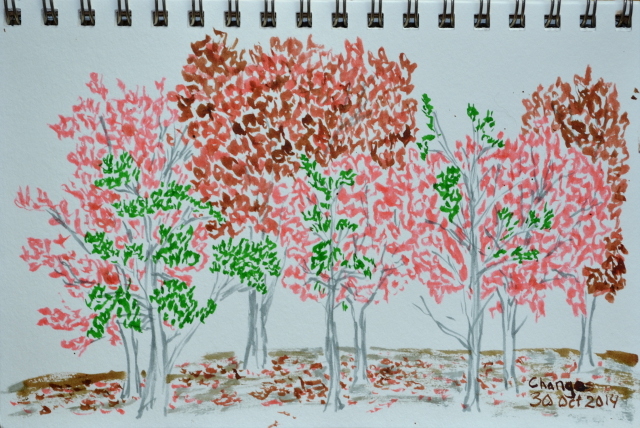 Back in Alice Keck Park Memorial Gardens where many of the large variety of trees turn colors. 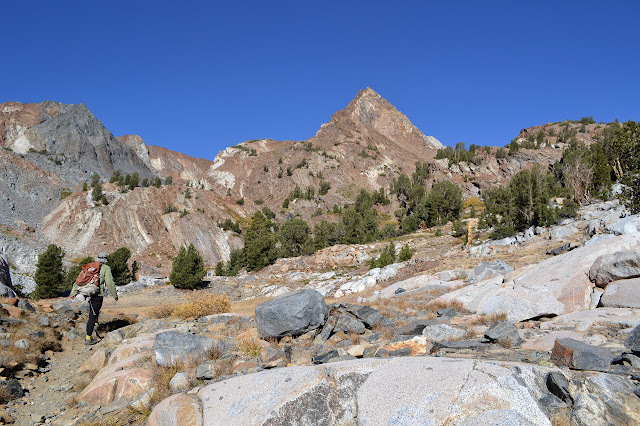 When the plan was to join folks who were working hard to claim Telescope Peak, the plan for the day before was Wildrose Peak with a side of section corners since three of them lie near the trail. This is a shorter trail, so we put it to the day with more driving. 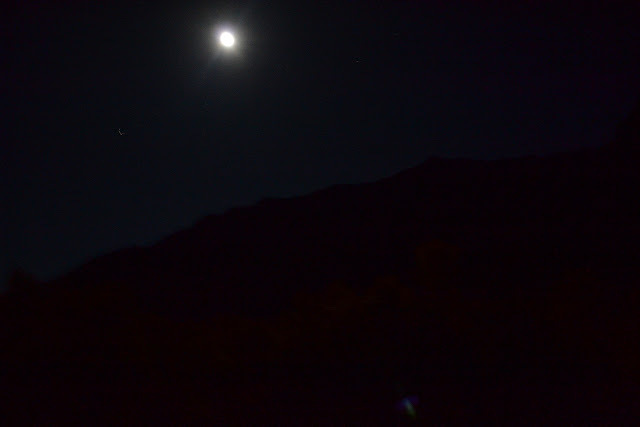 At the trailhead, we get stories about the wind from those who stayed in Mahogany Flat the night before. It seems the wind was constantly strong with gusts of stronger and made for an interesting night. One fellow said he slept in his jeep which was lifting up in the wind. One of this friends decided that the good was good and the bad was good. In Wildrose Campground, the wind would slow down greatly and lull us into a sense of security before coming up and, say, picking up a glove off the table and tossing it halfway down the campground. We begin to worry if we might have to share the trail with the dozens of people who seem to be clustering around, coming from camping above and driving in from below, but it turns out they are only stopping to have a look at the charcoal kilns that sit in a row beside the road. 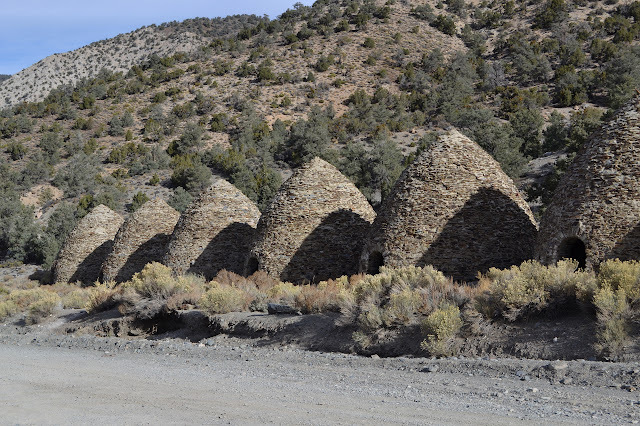 The charcoal kilns are just one monument of many to the history of mining in the area. Bernard did not want to go for another Sierra trip and decided he wanted to climb Telescope Peak from Shorty's Well over the weekend. There is water (way down around 3800) for camping although he really wanted to try to challenge himself and go for it as a day hike. 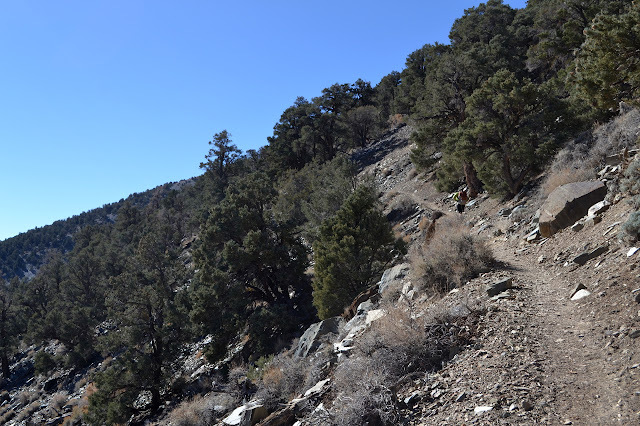 I did not like the sound of it, but was willing to go up to the peak in the much more easygoing way along the trail from Mahogany Flat, or as near as I could get along a road where high clearance is recommended for the last two miles. Unfortunately, those who did like the sound of it at first eventually thought better of it and bailed on him. At the last minute, he decided to go anyway for the shorter hike and so Saturday, mid morning, we are up at Mahogany Flat and ready to start hiking. 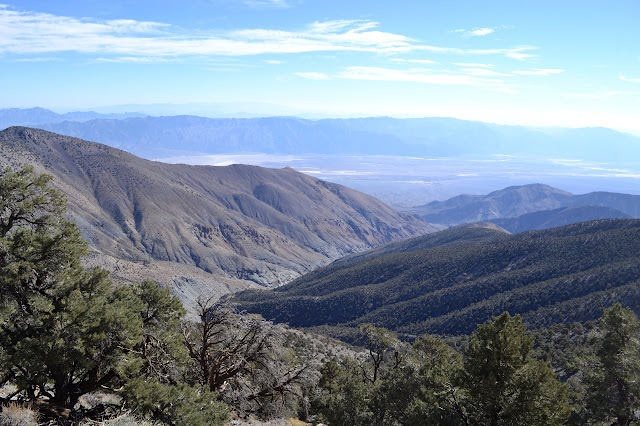 Looking down North Fork Hanaupah into Death Valley, for which the National Park is named. There goes Bernard, trekking past mahogany and pinion pine. The Los Angeles group of HIKE the GEEK are trying to get regular hikes together again and decided to hike in Franklin Canyon from a low point to a high point. The canyon is a narrow strip of green with sides sufficient to block out cell signals. At the bottom, the only indication of the vast city nearby are, well, the hoards of people wandering around, generally walking their dogs and a wall or two high on the edge. Oh, and photo enforced stop signs. There really are quite a lot of people. Our initial low point is the parking lot closest to the lower reservoir and we wander across the lawn of a former residence to find the trail heading up. The Conservancy rangers are putting together something to celebrate some sort of graduation for one of their volunteers as we go by. 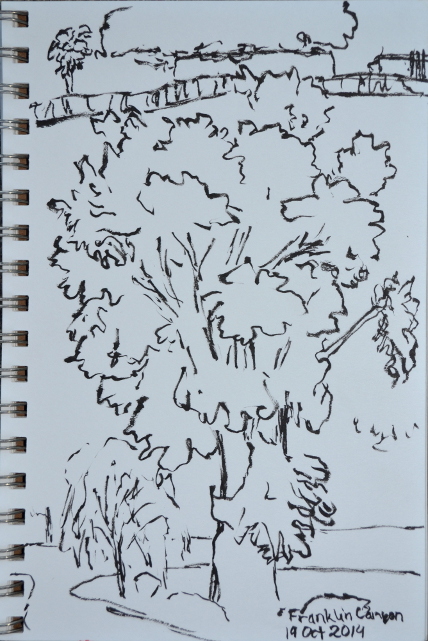 The trail starts in some trees at the edge of the grass and quickly climbs out of them and up the side of the canyon. 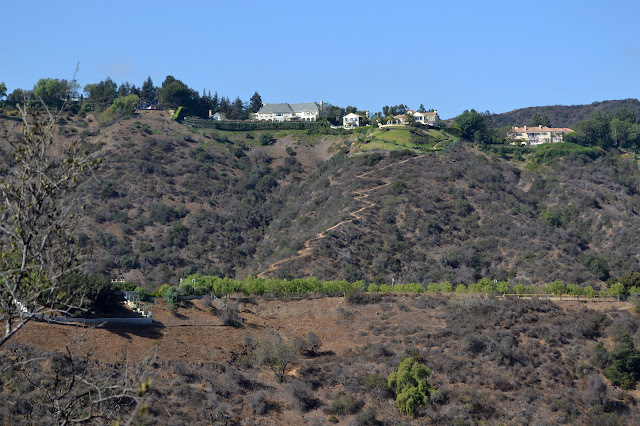 The houses at the edge of the canyon. Someone has their own trail down into the next canyon. 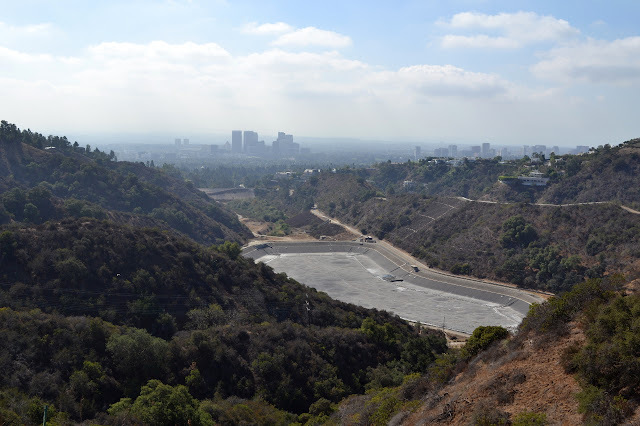 Looking down on the Franklin Canyon lower reservoir to find it a dry bowl of concrete. (Day 2 of 2) It seems like it should be colder than this in October at 10,000 feet. There is not the slightest sign of frost anywhere. Today, we can day hike up the last of the mountain, then grab the rest of our stuff on the way down and coast the rest of the way out. First, we have to get started and it is quite a late start. Ah, but the sun is upon us as we do. The night warmer than expected does not translate into a very warm day. Red and White Mountain with sun long before it gets to us on the other side of Big McGee Lake. 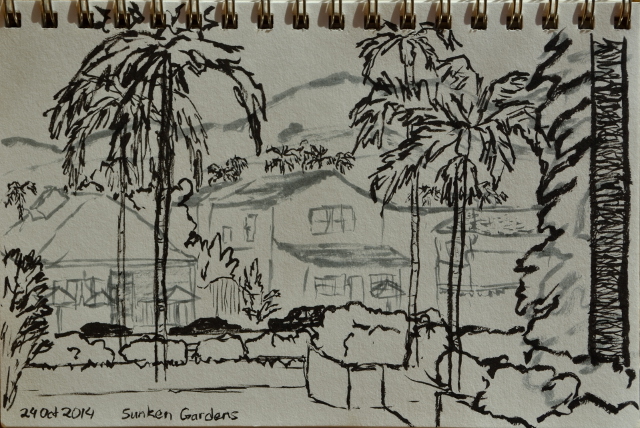 Starting out in the still cool, but now sunny, fall air. 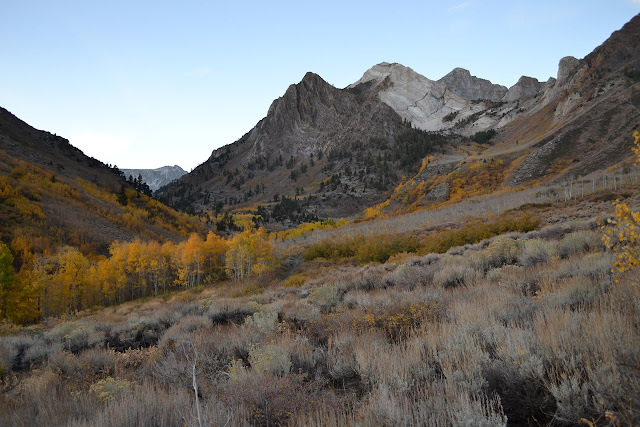 (Day 1 of 2) I have been hearing a vicious rumor that this time of year, one should be heading out to look for fall color, perhaps around Bishop and a few other areas. Then I noticed Red Slate Mountain. Who could resist that? Quite a few people by the summitpost entry which claims many prefer to go for the one peak higher in the Mammoth area, Mt. Ritter. 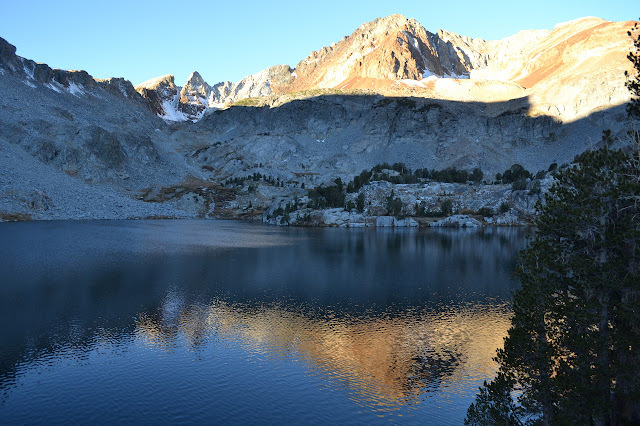 We get a late start thanks to planning around jury duty and hike in a little way under the bright moon for a little dispersed camping before the John Muir Wilderness boundary. There is no sign, so we may not have managed to stop before the boundary, but as it is after midnight, we definitely enter the wilderness on the permit designated day. We can see just enough under the great streetlamp in the sky to be excited about what the morning sun will show. The suggestion of tree tops among light and dark striped mountains. The morning does not disappoint. Bright yellows trace out the places that have some water flow, either from the creek or springs, in seasonal color. Above, the rocks are striped in whites and reds and greys and even blues in permanent color. A little packing and a little breakfast and we are ready to be off. Two groups, three people altogether, have passed by before we even start. We should probably be a little quicker to begin, but it is not all that late as we step out to climb the almost unnoticeable slope of the old road. The springs marked Horsetail Falls provide good flow for grabbing water. Alder and willow turn the bottom of the canyon and a bit of the sides yellow. Now where is that sun?